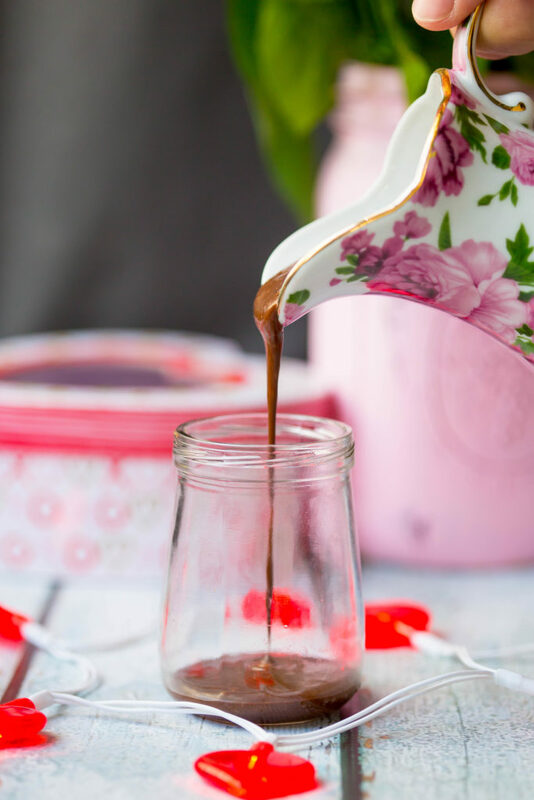 Easy Chocolate Covered Strawberry Pots de Crème are my go to show stopping dessert. Thick, velvety, rich, and creamy these delicious little chocolate pots look fancy, but they’re an absolute cinch to make. 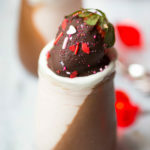 Chocolate Covered Strawberry Pots de Crème will melt the hearts of your favorite Valentine, Galentine, or blubbering guests at a frou frou baby shower. I am of the belief Valentine’s Day must be filled with chocolate…or at least show face during every meal of the day. Hot chocolate for breakfast, a couple chocolate truffles after lunch followed by a decadent dessert like these juicy gems. I always try to do something a little special for Valentine’s day because that’s what my parent’s always did for me. Making the diagonal layers isn’t as hard as it looks, and it really adds a nice pop of pizazz to the presentation, don’t ya think? Simply lean glasses (I used baby food jars) in a mini loaf pan or egg carton, pour in the chocolate layer, then refrigerate until it sets. Once set, top with the strawberry cheesecake, and refrigerate until firm. Blender pots de crème are perfectly fancy and frilly for any special occasion and will make 6-8 darling little desserts or 4 larger jars for the true chocoholics at heart. My husband loves him some sweet treats, but he’s more of a let’s-get-sloppy-strawberry-cheesecake-wasted super fan. That’s fine and all, but my philosophy is simple: dessert just isn’t dessert if it ain’t got chocolate. 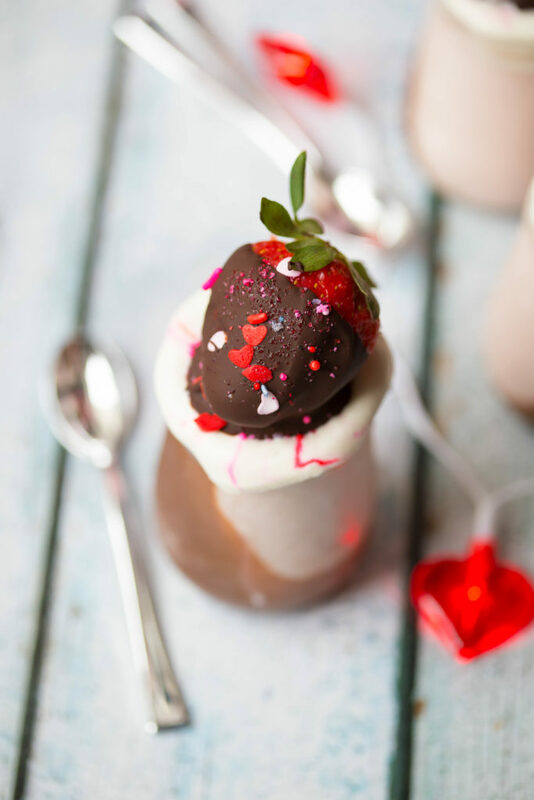 No Bake Chocolate Covered Strawberry Pots de Crème are the perfect marriage of our two favorite flavors. Luscious and rich semi-sweet chocolate blends into a silky layer of velvety fudge and is smothered with a creamy strawberry cheesecake and a cloud of fresh whipped cream. Raise your hand if you’re ready to get wasted on pots de creme! Add chopped chocolate and eggs to the blender and give it a whirl until the chocolate gets broken down a bit. About 15-30 secs. Leave the lid on. Heat milk in the microwave or on the stovetop until nearly boiling and bubbles form around the outside edge of the pan. About 1 1/2 minutes in the microwave or 5-6 minutes on the stove. Immediately pour the hot milk through the spout or the hole of the blender lid, cover the lid with a towel, and blend on high until the mixture thickens and becomes smooth, scraping down the sides as needed. NOTE: The hot milk should cook the eggs. Divide the chocolate mixture evenly between 4-8 ramekins or dessert dishes and refrigerate for a minimum of 1 hour until set. Once set, pour cheesecake mixture over the chocolate mixture and refrigerate for 3-6 hours or until slightly firm to the touch. 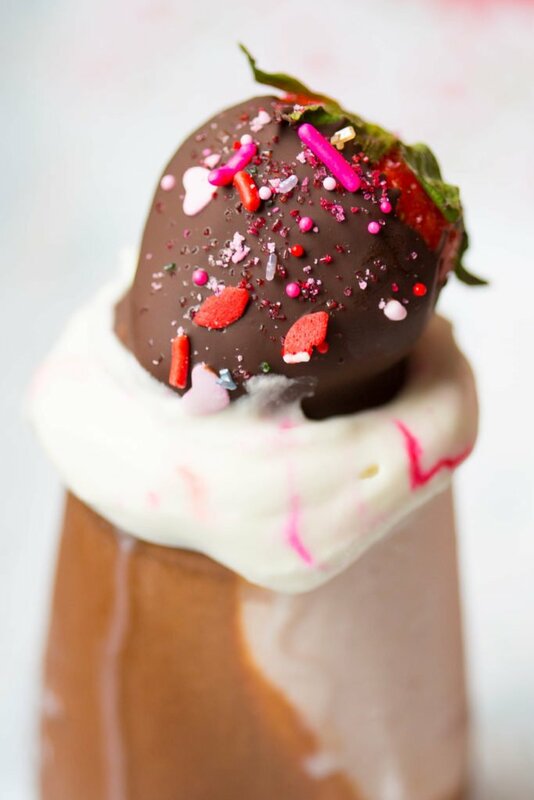 Top with a dollop of fresh whipped cream and a chocolate covered strawberry and serve. Add cream cheese, sugar, vanilla, and cream to a food processor or blender and blend until smooth. Add remaining ingredients and blend until no chunks of strawberries remain. 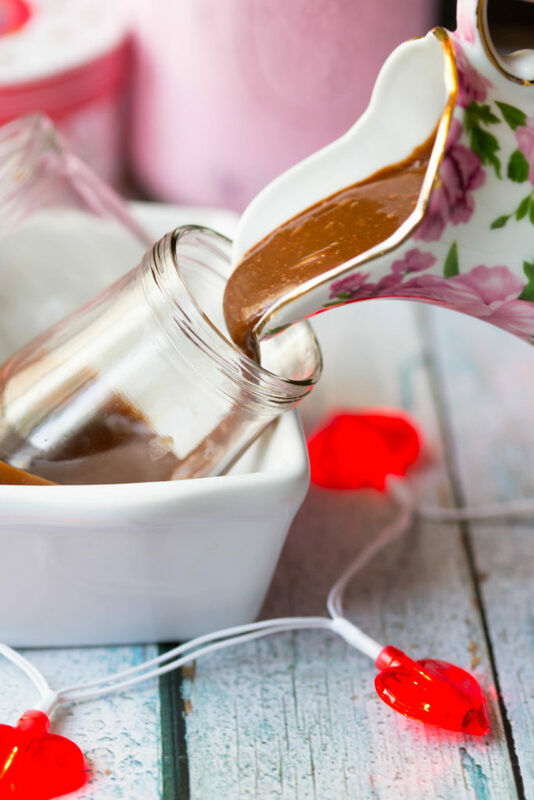 Pour on set chocolate pots de creme and refrigerate until firm. About 3-6 hours or overnight.